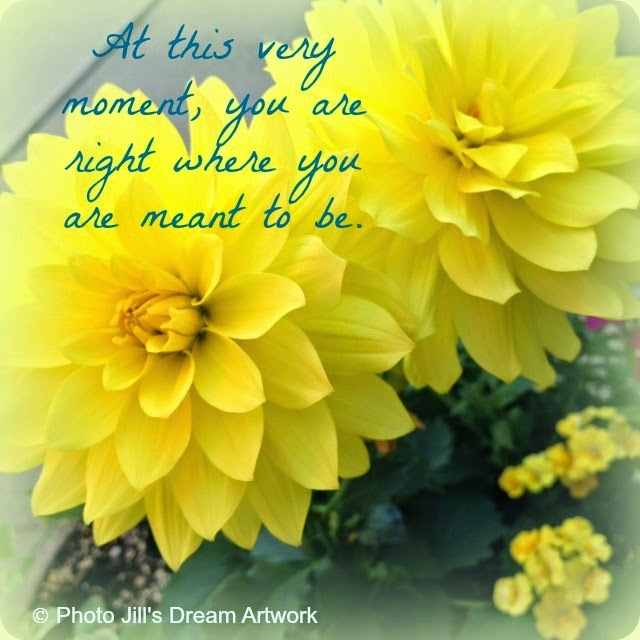 Welcome to the blog of Jill Lambert creator of Jill's Dream Artwork. This is my place to share real moments in life as well as my journey with creating art that hopefully uplifts and inspires you. Thanks so much for visiting! Opportunity for Creativity...even in Darkness? I've talked about and have sung the praises of writer Patti Digh and a few of her books in past blog posts. My favorite of hers so far is Life is a Verb - it changed my way of living and looking at how we spend our days, our moments. She's also written Creative is a Verb and I picked that up again two nights ago because I finished a novel and NEEDED to read something before bed. I started rereading but I paid special attention to lines and phrases I had highlighted in the past. This one really stuck out this time: "Every single moment of your life is an opportunity for creativity. Even the darkest moments. Perhaps especially them." (p. 14). Pretty profound as many people think only certain people are creative and I guess I typically think of making a physical piece (painting, book, floral arrangement, etc.) 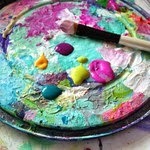 as expressing our creativity. But these words make me think it's way more than that. I've had some dark moments mainly due to health concerns and now I just got some test results that aren't so great. Friday I find out what the next step could be as I see the doctor to discuss the results. Hmmmm...I'm wondering that along with my word of the year "faith" and this quote about dark moments being opportunities for creativity, can I handle this? Can I handle possibly bad and scary news in a different way? A different way than I'm used to - catastrophizing and thinking of every worst possible scenario and playing them over and over in my head. I'm not sure how this can be an opportunity for me to use my creativity but I'm hopeful that I'll find a way. I hope I can infuse this obstacle, this fear with faith and creativity. I truly don't know what that will look like, but I plan to keep it in my mind in the upcoming days. I'm wondering if anyone else actually sees creativity as a "tool" so-to-speak to help with potentially really dark and scary times in their lives. If anyone has any ideas or examples I'd love to hear them. I know reaching out is a start because connections between others truly helps when healing is involved. The last few months I was so focused on creating Christmas art so once the holidays were over I felt a bit lost in terms of painting! I missed coming up with sweet and whimsical snowmen. Well I'm feeling like I'm getting back in the groove of non-holiday art. It took my awhile but I think getting my first easel for Christmas helped a bit because it was a fresh way of painting for me. 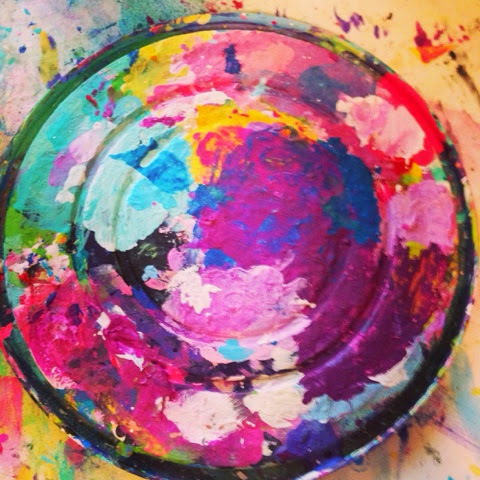 Sometimes something new or painting even in a different room helps kickstart things! Here are my first two officially completed paintings is 2015. 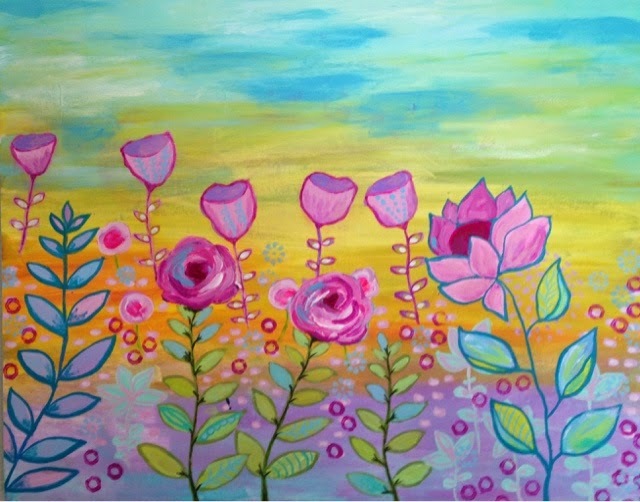 The vibrant floral piece is called "Summer Carnival." Flowers are always my favorite because they are colorful and uplifting and remind me of being outside during nicer weather. Ahem...it's about 5 below here, so seeing these flowers cheers me up a bit. The second finished piece is on wood, something I'd like to paint on more often because I'm very drawn to hand-lettered, rustic signs. Not that this one is very rustic but I hope to do more like this. I started not knowing what saying I wanted on here, just freely painted shapes, symbols, colors, waves. 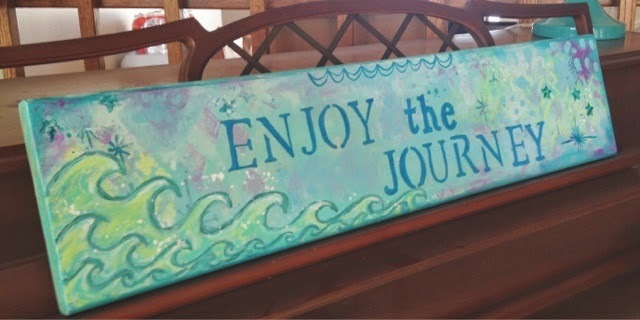 After a few ideas, I thought "Enjoy the Journey" was perfect. It's a reminder I know I need pretty regularly when I get wrapped up in worry or pushing through to the next day (i.e. Friday) without being with the one I'm presently in. I hope they give you a little inspiration or a little smile. I'm feeling good that so far my 2015 has had a good start in my personal life and in my art. Do you have any sayings that you keep in front of you as reminders to yourself? I'd love to hear them. I was sort of hesitating to choose a word for this year. Not sure why...maybe because I come up with too many words then worry I'll choose the "wrong" one. The more I thought about it I realized there's no "right" word and if I focus on more than one, that's okay right? I choose the word "faith" (I think...) for a few reasons, partially related to God and spirituality and partially not. I went to a Catholic school for eight years and learned about memorizing prayers and being afraid of God and that's about it to be honest. I am not a practicing Catholic anymore and we haven't attended church in over a year I think. But I've been feeling the need to have more faith in my life. Faith in God, faith in myself and faith that I can handle the obstacles life throws at me. When something scary gets thrown in my face, say health issues for instance, I instantly go into catastrophe, life or death mode. I realize that is a frightening way to live. I've been praying more and I find touches of calm when I do. Those touches of calm help me even if it's just for five minutes. When I talk to friends who have strong faith, they tell me just to give my worries to God. I've been doing that more and more and it does help me feel better about scary situations. 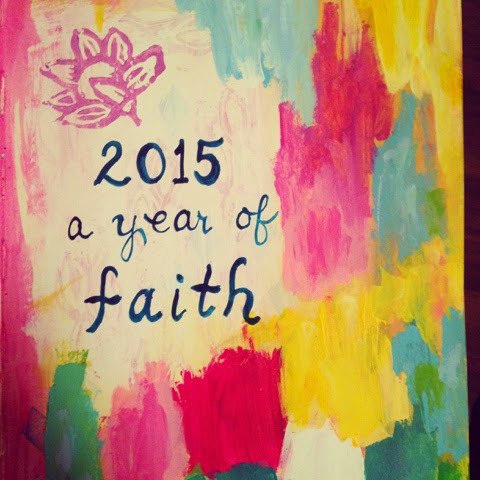 So this new year of 2015 I'm going to put my heart into having more faith in God and myself. I may have a serious surgery on the horizon and if I let it it will ruin my everyday life. Instead I keep thinking and saying to myself, "God will help me and I can handle this with faith in him." I'm not saying I'm 100% at ease and not worrying at all, but it's starting to make me feel better and that with faith I can get through most anything. Are you partaking in choosing a word of the year for 2015? If so, I'd love to hear about it. Hearing what others are focusing on inspires me as well. I love this time of year. It's exciting and cozy and those once-a-year decorations make everything joyful. Here are a few special ornaments on our tree. Bella and her Papa (my dad) when she was about 4 years old. He died a few years ago so it's very special to see this on the tree every year. A sweet and fun snowman ornament Bella made in grade school. I just love him! She no longer makes us handmade ornaments and I'll admit I miss that. This foam tree with blue sequins she made just for Daddy a few years ago. A sweet, chubby cardinal ornament that reminds me of my grandma. She loved cardinals and collected figurines of them, so everytime I now see a cardinal I say "hi Grandma" because she's no longer with us. It comforts me when I see one flying by or sitting in a tree outside. I bet you have a few favorite ornaments, some that have special meaning to you, ones that you will never get rid of. Care to share any of them with me? I'd love to hear about them and what they mean to you. When I got my new, blank journal I decided to go through my favorite quotes that I had written down and make sort of an inspiring book for myself. On each page I create a fun background and then go through my quotes and add them so I can have some artsy inspiration by my side, all in one book. I found this quote and knew I had to add it to my art journal. I'm not sure where it got it from, possibly Mark and Angel Hack, who have tons of inspiration on their website. It's so funny that I never thought this way before. I now DO notice that when I'm counting my blessings and thanking God and the Universe for things in my life, I feel more grateful - in turn I think LESS about the things I don't have or the things I do have that I wish I actually didn't have (ahem--lupus for example). Those are just a few but since Thanksgiving is approaching, I want to visit all the great things I do have to be thankful for. I'd love it if you'd share below a couple things you are so grateful for. It's so uplifting hearing about others gratitude. Lately I've been feeling the urge to paint the night sky and its sparkly stars. Not sure why I stopped but a few years ago I painted night scenes a bit more. The other day I popped open my brand new Dylusions art journal and the first scene became a night sky with a warm, full moon. 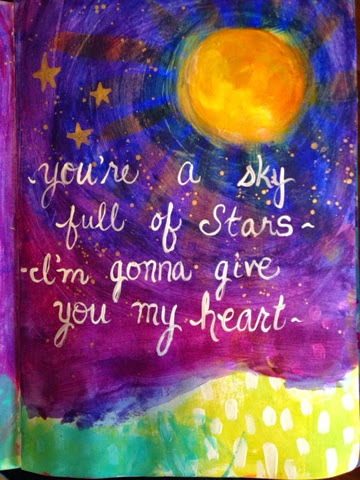 Then I felt like I had to add the words from the new Coldplay song, "You're a sky full of stars." I wanted to look up all the lyrics but got sidetracked (of course) as usual. A day or so went by and I went to listen to my new favorite acoustic/cover band Boyce Avenue while I was painting and the first video from them popped up and it was Coldplay's song. I actually decided that was a sign and those words needed to be on this painting. 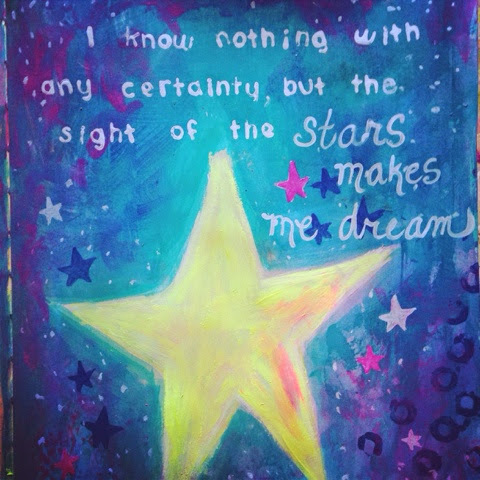 Next page in my journal started looking similar and on this I included Van Gogh's quote that fits me to a tee "...I know nothing with any certainty, but the sight of the stars makes me dream." Ahhhh is all I can say to this one. Our daughter's middle name is Sky if that tells you anything. I guess painting and sharing these creations on Instagram were a good thing because a sweet, creative friend of mine in turn requested a commission of a full moon, the night sky, stars and a quote. Here it is. I'm really happy with how it turned out. Does the sky mesmerize you like it does me? 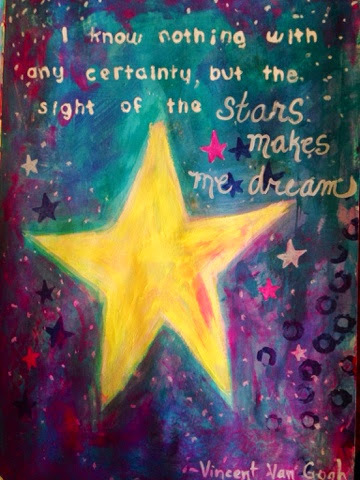 Do you have any favorite, dreamy quotes about the sky, stars or moon? It's so easy for me to be grateful and count my blessings when things are going well - namely when I'm not having a flare of my lupus. But I'm now learning and practicing that I have to be grateful even when things aren't exactly going my way. This is when I REALLY need to count my blessings. Over a month ago our dishwasher leaked and ruined part of our wood floor and base cabinets...at first I was pretty upset of course because of the major inconvenience and because of the $1000 deductible we have for insurance. Still not happy about that because I work VERY part-time. However, I realized we've wanted new cabinets and a new wood floor for quite a while. Of course, we wanted to get them when we could afford them and not because of water damage, but looking on the bright side, we are getting some updates to the kitchen. A few years ago this would have sent me into so much anger and frustration, but this time, I quickly got to the mindset of "what good is coming from this?" ...Well--new cabinets and a new wood floor-yay! Oh, and practicing acceptance and letting go of things that typically throw me in a tailspin. "Happiness is a function of accepting what is." This quote by Werner Erhard often helps me remember how important it is to accept things as they are, even when they aren't what I want at the time. Typically, like the kitchen, they turn out to be blessings in disguise. No they don't always come in the form of something physical like kitchen cabinets--they may be a new way of being or living, like enjoying the little things and realizing something that's RIGHT for us is somewhere on the horizon, even if we don't see it right away! I'm curious, what "bad" things have happened in your life that have turned out to be blessings in disguise? I am a mom, wife, sister and friend who loves the water and dreams of living by the Caribbean Sea someday. Painting vibrant pictures is my passion and I enjoy showing my work at art shows. When I'm not painting or working, I'm reading books every chance I get. Living on the Specific Carbohydrate diet (scd). It is launching us into a total health transformation. We will triumph over Crohn's disease.